Shares TD Ameritrade posted their single worst day on Wall Street since Feb. 28, 2017, falling 7.1 percent; E-Trade notched its steepest loss since March. The move by J.P. Morgan aggravates a cold-blooded price war, with the globe's largest managers fighting for clients with low-cost options. J.P. Morgan will launch its new service next week. All customers get 100 free stock or ETF trades in the first year. Those with Chase Private Client get unlimited trades. 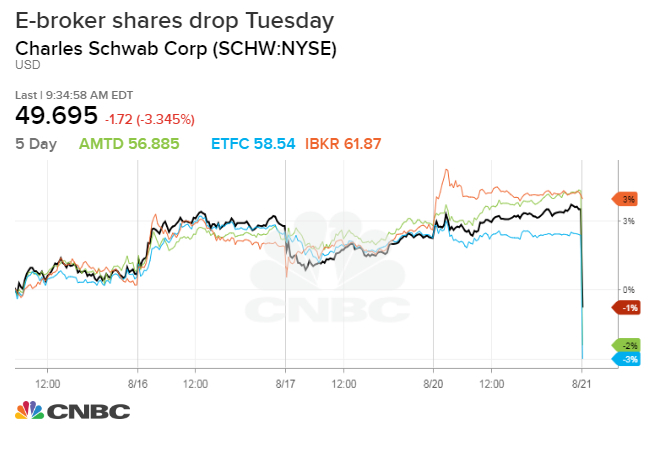 Online brokerage firms including Charles Schwab, TD Ameritrade and E-Trade sank Tuesday after CNBC reported J.P. Morgan Chase will offer a new digital investment app with free trading. Shares TD Ameritrade posted their single worst day on Wall Street since Feb. 28, 2017, falling 7.1 percent while E-Trade notched its steepest loss since March, falling 4.3 percent. Charles Schwab's stock fell 2.4 percent. The new program comes bundled with free or discounted trades, a sophisticated portfolio-building tool and no-fee access to the bank's stock research. Responding to the move, a TD Ameritrade spokeswoman told CNBC that the company is "very well positioned to compete and win in a low-cost environment." "However, the competitive environment will likely continue to shift, and we will remain nimble," the spokeswoman added. "We continually evaluate our offerings and pricing, taking into account recent competitive changes and enhancements." For its part, e-broker Interactive Brokers said in an emailed statement that the company "will continue to be the choice of sophisticated investors and institutions." "Other banks and brokers that give away so-called free or cheap trades make their money by paying next to nothing on idle balances, executing trades at inferior prices, and charging exorbitant borrowing fees, which is costly to those that don't do their homework," wrote Steve Sanders, Interactive Brokers' executive vice president of marketing. The company's stock fell 2.5 percent Tuesday. "Since its founding, our firm's priority has been to make investing more accessible and affordable for all investors – providing clients with exceptional value, service and transparency," said a Charles Schwab spokesman. "Any action by others to help people invest in their futures is positive, and Schwab will continue to aggressively lead the way in improving how people invest and manage their wealth." Remarking on the fall in the stocks, Rich Repetto of Sandler O'Neill & Partners said that while the move could weigh on e-broker earnings, he is not overly concerned about the group. "It's not good, but it isn't the end of the world. They will all still be profitable, but certainly today the stocks will trade down on the headline risk," the analyst told CNBC. "What you also should know is about one-third of trades at TD Ameritrade and E-Trade are derivatives, options trades, which would require a more complex platform." The move by J.P. Morgan aggravates a cold-blooded price war throughout the investing world, with the globe's largest managers fighting for clients with lower and lower fees. The cost of executing trades, managing portfolios or owning part of the $3.5 trillion exchange-traded industry has plunged as investors turn toward passive investment options. "What this is all about is J.P. Morgan's way of growing their customer base," said Gerard Cassidy, RBC Capital Markets banking analyst. "If they can attract new customers with this type of product, and then cross-sell into those customers other, more profitable products, they come out ahead," he added. As one of the latest advances, Fidelity Investments announced earlier this month that it would be the first fund company to offer core index funds without management fees. "Investors will pay a 0.00 percent fee, regardless of how much they invest in either fund, while gaining exposure to nearly the entire global stock market," Fidelity said in a release. BlackRock, the largest money manager in the world, said in June that it would continue to cut fees on a number of its products with the highest growth potential just days after slashing fees on 11 of its exchange-traded funds. "Reduced barriers to trading and investing, including zero commissions, will make it easier to buy ETFs and other investments, which is great for retail investors," Martin Small, Head of U.S. iShares at BlackRock, said of J.P. Morgan's move in an emailed statement to CNBC. The company is locked in a fight for assets with rival financial titan Vanguard Group, made famous for its own low-cost index funds. — With reporting by CNBC's Fred Imbert and Hugh Son .